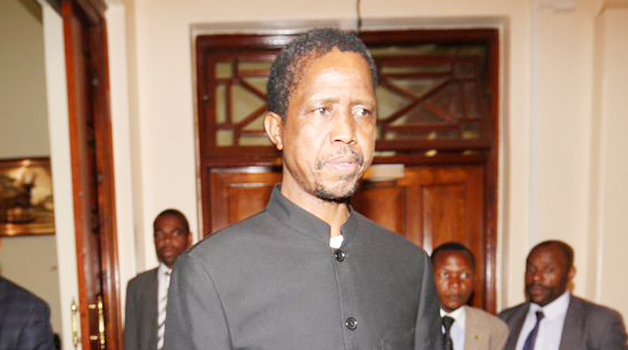 PRESIDENT Lungu has said the Patriotic Front (PF) will get rid of all Members of Parliament (MPs) and senior party officials that are not loyal to the party. The President said the party is scrutinising officials because he does not want to work with people that are playing double standards in the run up to the 2016 Presidential election. He was speaking yesterday in Chawama where he had gone to drum up support for PF candidate Lawrence Sichalwe in tomorrow’s constituency by-election. Mr Lungu said the PF will not allow senior party officials to be lukewarm in their dealings because 2016 needs people who are loyal to the party. He said those unsure in their loyalty to the party should not wonder if they are left out come 2016 because the assessment is being done in order to get rid of those with unclear vision in the party. “There is no cartel in PF, we want members who are loyal to the party because this is the only party which is going to bring unity, peace and development, here I am busy looking at who is here or not, this is the beginning and we want to work with genuine members, we do not want confusion,” Mr Lungu said. He expressed confidence that the ruling party would scoop all the three parliamentary seats, which also have Masaiti and Senga Hill. “I want to take this opportunity to call upon all employers in all the three constituencies to allow their employees to vote for their leaders because they have the right to vote for their leaders,” Mr Lungu said. He asked all party officials to mobilise themselves countrywide and ensure that they welcomed new members to the party in preparation for 2016 tripartite elections. The President said the electorate should start making MPs accountable for work in their various constituencies and make them know that they would not be adopted if they have failed to deliver. “We hate rebels in our party, we shall get rid of them soon, when you are left in 2016, do not be shocked your works will have to speak for you, if you are in the opposition and think you are PF, join us so that we are sure, we want to work with people with quality leadership,” he said. United Party for National Development (UPND) senior member Paul Moonga and 280 other members have defected to PF citing selfish leadership in the opposition party. Meanwhile, President Lungu has directed the Road Development Agency (RDA) to ensure that all road contractors engaged to work on the L400 road projects, prioritise youth employment. Mr Lungu said after touring the L400 project in Lusaka’s Chawama Tonwship that it was vital that RDA takes up the challenge and monitor the employment of youths, which was one of the major visions for the Patriotic Front (PF) Government. Mr Lungu has also ordered that the project be expedited and advised contractors to dialogue with responsible officers in an event they are facing any challenges. He asked all MPs to ensure that they tour developmental projects in their areas and ensure that youths were employed.